SmarterBuildings by Sam Buckby is redefining how our homes are designed. We partner with architects, builders and renovators to design intelligent control systems that make our homes more automated, efficient, sustainable, secure and above all, simple to use. Sam's workshops are the perfect starting point for your next Smarter Building. 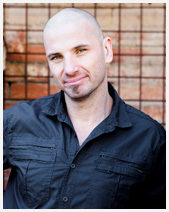 Sam is the owner, founder and creative mind behind Smarter Buildings. He has over 18 years experience in the industry and has spent the last 10 or so at the helm of a successful electrical contracting company. Through his whole working life he has seen the evolution of technology becoming part of our everyday lives. However, the housing industry is much slower to evolve and Sam believes he can do something about it. Sam is the expert when it comes to designing advanced systems for state-of-the-art homes and he achieves extraordinary results. If you’d like to join him and make yours or your client’s home a Smarter Building, register for a Smarter Buildings Workshop today. Spaces. They influence every part of our lives – our health, wealth and happiness. They have such an impact on our lives and most of us rarely stop to think about how they should be designed, let alone lived in. That’s why I wanted to start my podcast – a podcast series where we look at built environments created with performance, purpose and people in mind. And… how today’s advancements and technology are making these buildings more functional than ever. From functional and practical design elements to security and technology, I will be interviewing industry experts and diving deeper into design, construction, technology and the evolution the spaces we choose to spend our time in… Now… And in the future. The podcast is for people to gain insight into the world we build for ourselves, to help make our buildings smarter and create healthier and happier spaces. In order to achieve a home that is truly connected with the people within it is all about the planning and design. This is the most common hurdle for aspiring Smart Home owners as the installations are generally either a last minute thought, sometimes even retrospective. Think about the fundamentals of housing. When you are considering the size, shape and aesthetics you engage architects to help. When the building’s strength and structural integrity are to be assured an engineer is required. For many this is when most new home or renovation concepts are put out to your builder for a proposal based on budget, time frames and quality of build. So aren’t we missing something? At what point did we design how this place is going to work! At SmarterBuildings we predominately work with the generation of people who are striving for their dream home. A home that is designed as an extension of the people within and a home that over delivers on some of the key elements a home needs to provide in security, efficiency, lifestyle and simplicity. SmarterBuildings design the newest and coolest home automation technology that has gone past the gimmicky products of the past to offer one-touch, intuitive control of the whole home in an integrated package that is robust, future proofed and above all, simple to use. At SmarterBuildings we honestly believe that the difference between a home with ‘cool features’ and a home that is intelligent and aligned with the people within is all in the planning. For this reason we want, even need, our clients to develop an understanding of each of the steps and decisions required to truly achieve this. We’ve all experienced new gadgets and gimmicks being thrust upon us and then been left trying to work out how it will benefit us. But if there was a way to first identify the benefits we need from our homes, then reverse engineer the whole process to then find the products and systems to fulfil our needs… Wouldn’t this be a better way? Well, that is the SmarterBuildings way. So what is the best way to work out what we all need from our homes? Well we’ve got plenty of ways to help you out including books, webinars, design packs and consultancy services. 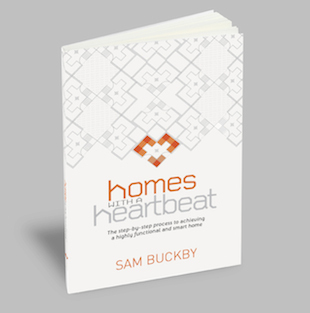 Sam’s first book, Homes With A Heartbeat, is the first step in unpacking your values and identifying the real benefits a SMARTER BUILDING can deliver. To download the first chapter of his book click here. 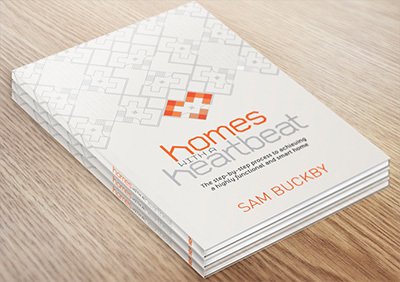 To pre-purchase a of copy of Homes with a Heartbeat Contact us. Sam & the team at SMARTER BUILDINGS work with many corporations and industries to promote the value of more functional buildings. To download a media pack click here.